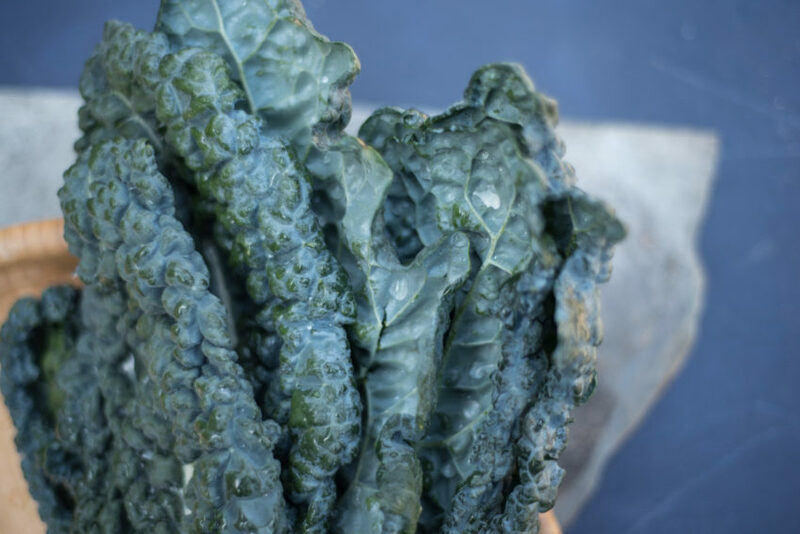 Have you ever tried dinosaur kale? It’s the Italian version of kale, and it has a deeper delicious flavor. But, most of us think it’s a little too tough. An easy fix is to break that fiber down just a bit by tossing it in a warmed vinaigrette with your fingers. This salad I use for those times where we just feel “blah”, when you need some cleaning and renewing from within. I would consider almost every ingredient in this salad a superfood (and i know that term is used lightly, but I use it very seriously!) Strawberries are powerful for your cardiovascular system, pumpkin seeds have iron and magnesium, pear has soluble and insoluble fiber, garlic is immune-boosting, raw apple cider vinegar has probiotics for your gut, and lemon zest is excellent for your liver….I could go on and on! By the way, when it is shaved very thinly, sweet potato can be eaten raw – it’s sweet and crunchy. This is easy to do with a vegetable peeler at home! You only need a little bit on this salad. Superfood Salad is easy, filling, a delicious combination of flavors, and most of all, makes you feel like you can conquer your day. 1. Use a small saucepan to heat the oil to over low heat. Smash garlic clove with the side of a knife, and add it to the oil. Let the garlic clove simmer just one minute, and then remove it. Remove pan from heat, add in apple cider vinegar, lemon zest & sea salt, swirling the pan to combine everything. 2. Add chopped kale to a salad bowl, and pour warmed olive oil vinaigrette mixture over. Toss around with your hands, to make sure every part of the kale is coated. Kale will start to break down just a bit and become brighter green as you coat the kale. As it does this, it means it will be easier to digest, and be more flavorful as well! 3. 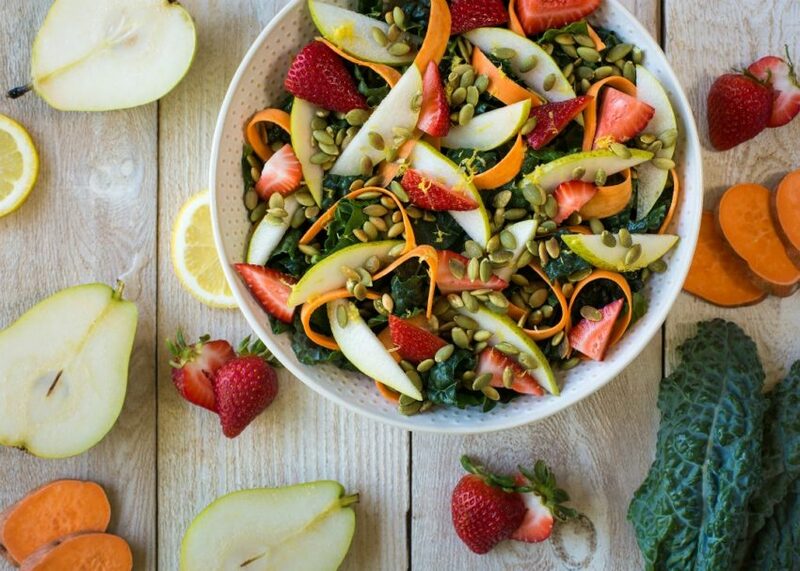 Layer on pear, sweet potato, sliced strawberries and pumpkin seeds. Enjoy the Superfood Salad with a giant fork & appetite! sweet potato that is shredded very thinly can be eaten raw, to offer a nice, sweet crunch and many nutritional properties. It is easiest to do this with a vegetable peeler. The sweet potato becomes a little softer when it is mixed in the vinaigrette. sub pears out to use whatever fruit is in season. Example would be apples, peaches, plums, all work well!